It’s something you don’t want to hear: the distinct gurgling noise of your septic tank, letting you know that something could be wrong. Homeowners everywhere know the heartache involved with blockages and backups, and so wish to avoid them when possible. If you happen to hear your pipes and septic tank making those gurgling sounds, there are a few different things that could be wrong! Gurgling sounds in your drainage pipes could indicate blocked plumbing drains, which result in slow drainage and the distinct gurgle noise in fixtures that serve that drain. Another cause of the unwanted noise is a blockage between the pipes used to connect your home’s plumbing to the septic system. 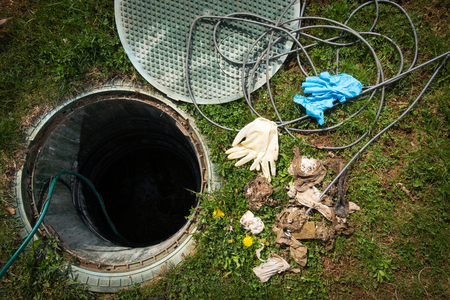 You may have a plugged house sewer vent or blockage in the pipes between the drain field and the septic tank. When this happens, your drains may function correctly on the average day, but increased water use will result in problems. Larger amounts of water that cannot seep past the blockage increase the gurgling noises and decrease drainage speed. Drain vents, which remove sewer gas from the pipes, may also make a gurgling sound if experiencing issues. The system could be inadequate or broken if you hear gurgling in the shower or sink after flushing your toilet. Another possible cause of gurgling is if your septic tank is too full. The tank will not drain properly as sewer lines are blocked and water cannot flow out as it should. Though there are some at-home remedies for gurgling pipes and septic tanks, the best thing to do when you hear gurgling is to call in the professionals to check your septic and plumbing systems. Oftentimes the extent of the problem goes beyond what you see and having someone check on your system could prevent your septic issues from spreading. When your commercial or residential septic tank is gurgling, it’s time to call the Sykesville, MD experts at Freedom Septic Service, Inc. for septic service and repair you can trust. Give us a call at 410-795-2947 today!